April Greiman, an art and design luminary whose collaborations with acclaimed architects such as Frank Gehry and RoTo Architects have earned her frequent critical praise and an international following, will present a lecture at Loyola University New Orleans Thursday, Feb. 28. Part of the Department of Art and Design’s ongoing lecture series, the event is free, open to the public and will take place at 6:30 p.m. in Nunemaker Auditorium in Monroe Hall. Free parking will be available in the West Road Garage. 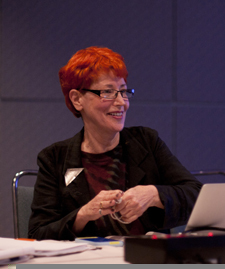 Often recognized as one of the first designers to embrace computer technology as a design tool, Greiman is credited as one of the creators of the New Wave design style in the U.S. during the late 1970s and early 1980s. Her trans-media projects and innovations are grounded in the fusion of art and technology and have been influential worldwide throughout the past 30 years. She is celebrated for actively challenging interdisciplinary boundaries and investigating the parallels and intersections between art and design in all aspects of her work. Greiman’s works are featured in the permanent collections of The Museum of Modern Art; the Library of Congress; the Smithsonian’s Cooper-Hewitt, National Design Museum; and the Pompidou Center in Paris, France. Solo exhibitions include the Visual Arts Gallery at the School of Visual Arts in New York and the Pasadena Museum of California Art. She has also exhibited in varied cultural institutions, lectured academically and professionally, generated public artworks and participated in juries worldwide. Her numerous awards and accolades include the Medal of the American Institute of Graphic Arts and the prestigious Chrysler Award for Innovation. A native of New York City, Greiman studied at the Allgemeine Kunstgewerbeschule (General Arts Trade School) in Basel, Switzerland and the Kansas City Art Institute. She relocated to Los Angeles in 1976 to establish her multi-disciplinary practice, Made in Space. For more information, contact Jess Brown at 504-861-5882.